The University of Florida women’s golf team had a solid start to the second round of the NCAA East Regional on Friday, but could not keep their rhythm on the back nine holes. Although the team improved their score by four strokes from the previous round, they fell three places on the team leaderboard to 17th place after carding a team total score of 606 (305-301). For the second-straight round, the team was led by freshman Evan Jensen. Jensen was one of three Lady Gators to card a five-over 75 in her second round, but her first-round score of 71, gave her the best total score heading into the final round. With a six-over 146, Jensen is currently tied for 19th place. Redshirt sophomore Lauren Uzelatz and freshman Andrea Watts carded the same score for the second-consecutive round, as both Lady Gators are currently tied for 36th place after carding a five-over 75 for a total score of 153 (78-75, +13). Uzelatz saved her best for last, notching her first birdie of the event on her final hole. Watts also collected her first birdies on Friday, carding one-under-par on the 7th and 17th holes. Redshirt sophomore Nicole Schachner improved her first-round score by two strokes, carding a five-over 75 in her second round of play. She is currently tied for 75th with a 36-hole score of 154 (78-76, +14), just one stroke more than Watts and Uzelatz. 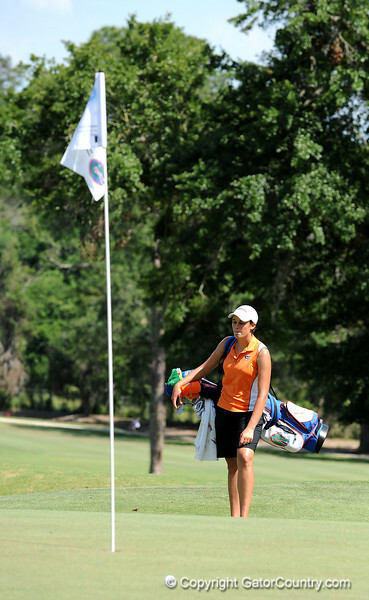 Jessica Yadloczky rounded out the Lady Gators lineup, currently tied for 86th place. The sophomore shaved one stroke off her second-round score for a two-round total score of 157 (79-78, +17). The Lady Gators tee off for the third and final round on Saturday at 11:50 a.m. Admission is free.